For the village in Iran, see Kulim, Iran. For the federal constituency represented in the Dewan Rakyat, see Kulim-Bandar Baharu (federal constituency). The Kulim District is a district and town in the state of Kedah, Malaysia. It is located on the southeast of Kedah, bordering Penang. The town of Kulim, a mere 27 km (17 mi) east of Penang's capital city, George Town, also forms part of Greater Penang, Malaysia's second largest conurbation. The Kulim’s independence clock was officiated by the Sultan of Kedah (15 September 1957) and serves as the unofficial landmark for the city of Kulim. The construction of the clock was completed within 3 months and upon completion 1833-1888 Capital States Kedah : Kulim, was made formalized by DYMM Tuanku Sultan Badlishah Ibni Almarhum Yang Di Pertuan Paduka Seri Sultan Abdul Hamid Shah, KOM, CMG, KBE Sultan Kedah on 15 September 1957, or 2 weeks after the declaration of independence of Malaysia (31 August 1957). Kulim District is administered by Kulim Municipal Council. Ismail Omar, formerly the 9th Inspector General of Royal Malaysian Police, currently Malaysian ambassador to France. Gary Steven Robbat, professional football player for Johor Darul Takzim F.C. Suppiah Chanturu, professional football player for Johor Darul Takzim F.C. Muhammad Akram Mahinan, professional football player for Johor Darul Takzim II F.C. ^ "Profil Daerah Kulim" (PDF) (in Malay). ^ "Population Distribution and Basic Demographic Characteristics, 2010" (PDF). Department of Statistics, Malaysia. Archived from the original (PDF) on 22 May 2014. Retrieved 19 April 2012. ^ primuscoreadmin (30 December 2015). "Latar Belakang". ^ primuscoreadmin (30 December 2015). "Profil YDP". ^ "TABURAN PENDUDUK MENGIKUT PBT & MUKIM 2010". Department of Statistics, Malaysia. Retrieved 15 December 2017. ^ Kulim’s Background Archived 2010-04-08 at the Wayback Machine, Laman Web Rasmi Majlis Perbandaran Kulim (Official Website of Kulim Government). January 16, 2010. 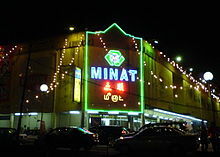 ^ Kulim’s City Centre Archived 2010-10-31 at the Wayback Machine, Kulim’s Municipal council website-Kulim’s Background October 31, 2010. ^ "Tan Sri Haji Ismail Bin Haji Omar" (in Malay). Royal Malaysian Police. Retrieved 5 May 2012. Wikimedia Commons has media related to Kulim. italics indicates an ongoing construction project. This page was last edited on 20 April 2019, at 06:34 (UTC).